So You are going to be shocked but Saturday we only worked on the house for a bit because PC & I had to leave for Doti & Wade’s wedding. It started at 2pm and we were 2 1/2 hours away so not much time to work. Plus for once I actually slept in! Woohooo! I’m still tired today so I guess it wasn’t much of a sleep in… Once we get this house done, I declare there will be a NOTHING weekend, a sit around and sleep and watch tv weekend, a get fat eating everything weekend… SOMETHING! So we headed to Mountain Grove for Doti & Wade’s wedding. Mountain Grove is a lot bigger town than I thought it was, I was surprised. We passed through there on our way to Kentucky but I guess I didn’t pay any attention. Their wedding was beautiful and before the wedding we got a show. The Maid of Honor kept moving the bride’s family around. It was cute! So after the wedding we were going to head to the reception but Tbug was with us this weekend, she was back home hanging out with Memaw and PC’s family by the pool so we figured since it was a 2 1/2 hour drive we should get home or else it would be late when we got back. So I’m sure the semi truck driver got a show. We both had extra clothes with us so I took my shot at changing first since I had on a dress and I wasn’t in the driver’s seat. Mine was easy, pull up the shorts and pull down the shirt and get out of dress. Easy as pie. PC was where the semi driver I’m sure got the show. (he stared at us when we finally caught him and passed him) PC had on a long sleeved buttoned down shirt with a pair of black slacks and then his black dress shoes and black dress socks. Well he untucked his shirt and I went to unbuttoning it and then helped him get it off. Then got his t-shirt ready for him (yes all while he was driving, I know that’s bad!). We also changed his socks. We waited for the pants, we pulled off on a side road which made it easier. Well after he pulled off we both decided, you know I have to go to the bathroom… yeah we could have changed in a bathroom but oh no, it’s so much more fun to change driving down the road. Especially in the front seat of a Mustang! 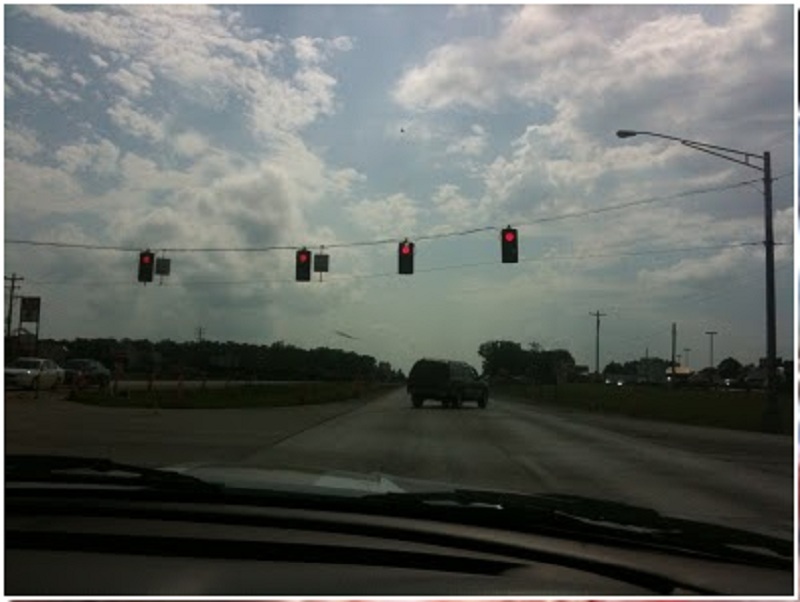 So we stopped at this nice Casey’s (the gas station on the other side looked dingy and me with dinge….). So while we were there we got something to drink. Well as we were paying I saw this…. I so knew I had to have it so I bought it!! Come on… Look how cute it is! Who wouldn’t want that? Mmmm it was just as tasty as it looked. 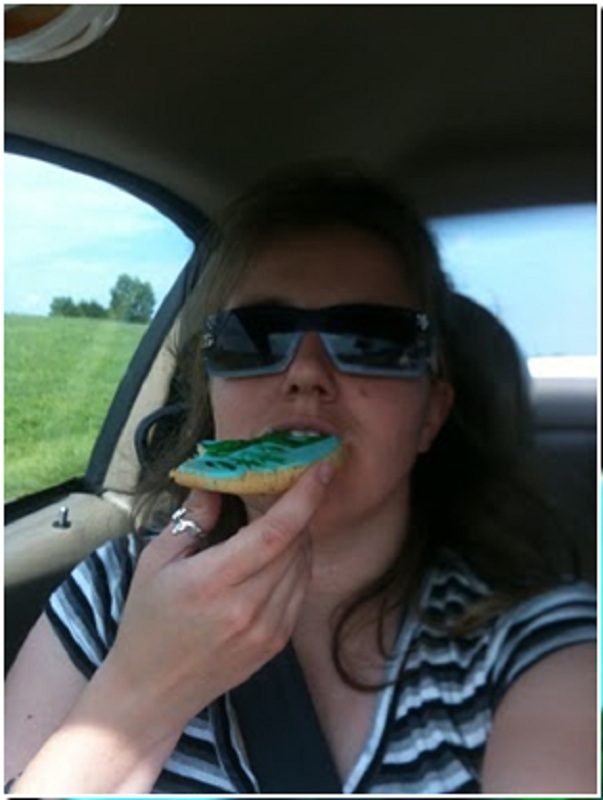 It was a delicious sugar cookie! Plus I’m eating the grass… that’s very nutritious! A Cherry Coke Icy! 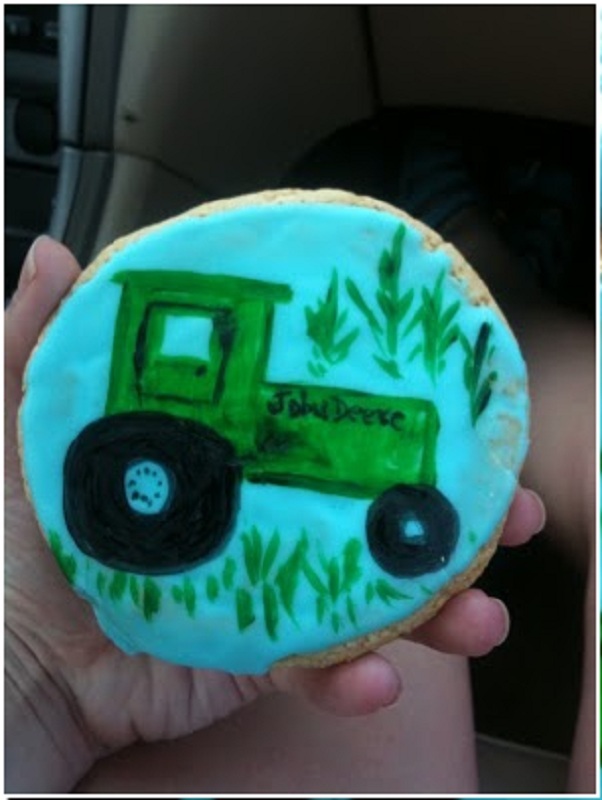 Perfect to chase the tractor down with! I was trying to get the stupid cup out of the dispenser and it wound up throwing 4 at me. Then I got my icy and went to get a lid. It spit 3 out at me… sigh! So as I went to put the 3rd lid back I dumped my icy down the side of one of the lids so I wound up needing the 3rd lid anyway. The store had camera’s up and the attendant could see this all on the tv’s. I bet she was sighing at me! Peace, Love, & nutritious snacking! I agree, the cookie was cute! Cookie is cute! We don't have Casey's in the Pacific Northwest, but I've seen 'em when we're back in MO and IA. Ah, tractor love and it's a Deere too. Oh, road trips are the best!! 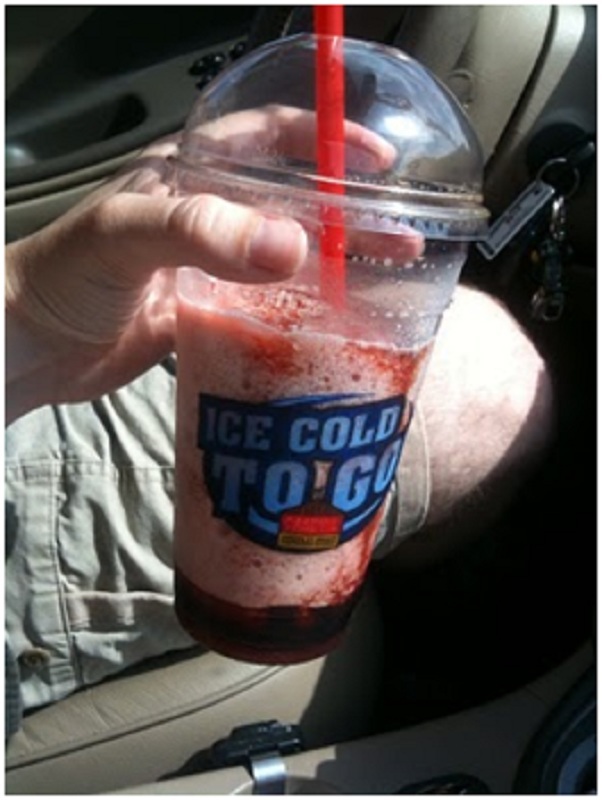 Cherry coke icee?? I have never heard of that flavor!! btw, I'm a new follower:) can't wait to read more! Hmmmm…. sounds perfect. 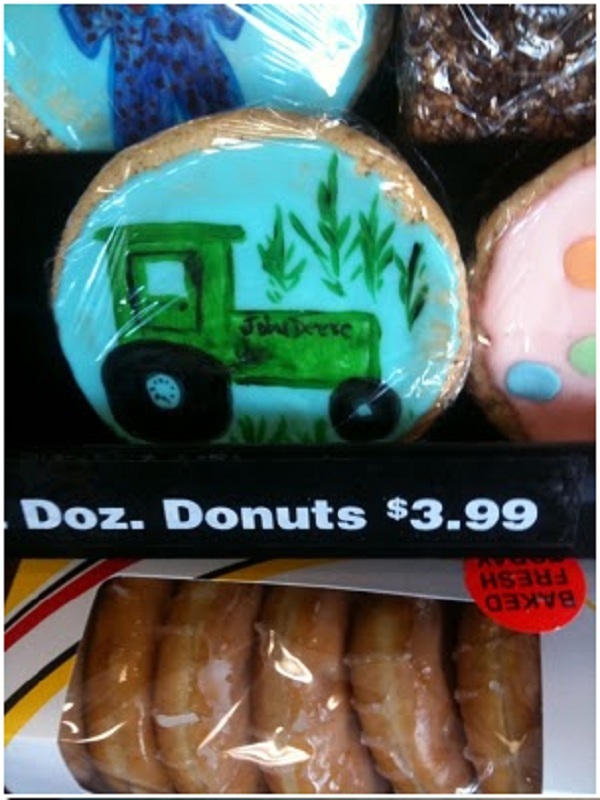 Who woulda thought from a convenience store not a bakery. Yummm…. 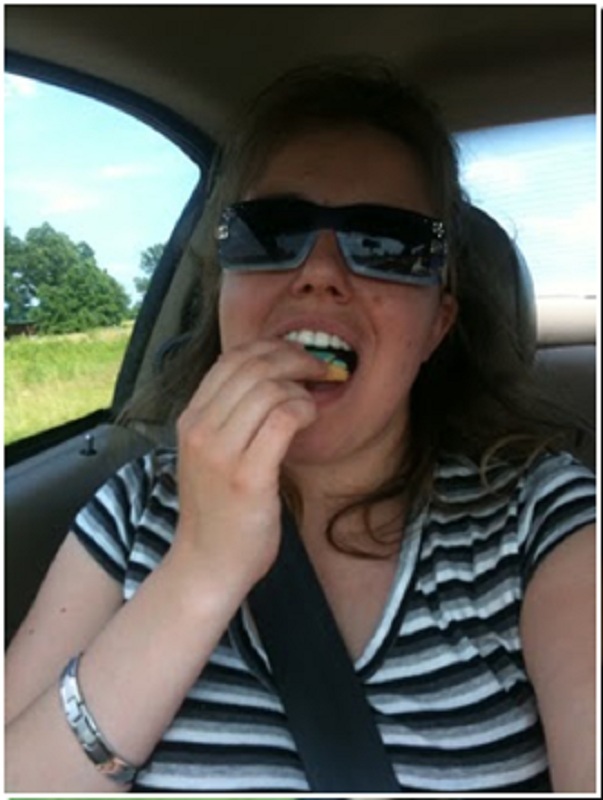 lol I love road trip food haha. 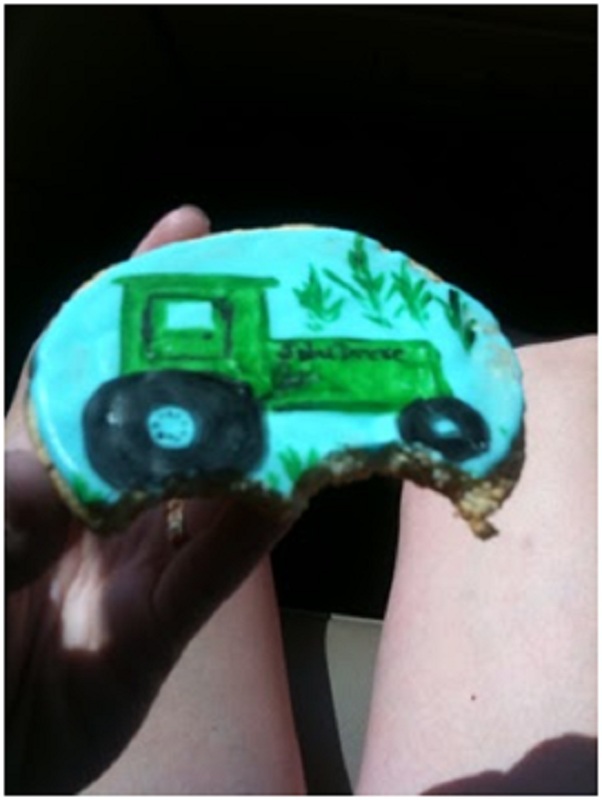 And that John Deere cookie is pretty cute I must say!